The eleventh edition in a series of posts that highlight one Expert Author who has achieved success by doing just one thing exceptionally well. When Pawel Kalkus isn’t studying for his university degree, he finds time to share his wealth of knowledge by writing articles for EzineArticles. In early 2009, he started writing articles to share professional dog training advice he’d learned over the years. As an Expert Author, his current goal is to summarize all of the most useful bits of knowledge he has gained through trial and error. During his most recent article writing and marketing campaign, he wrote and submitted over 100 articles in just 1 month’s time! 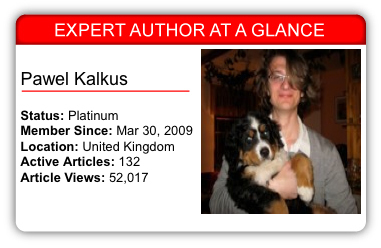 According to Pawel, the secret to his success as an EzineArticles Expert Author is his ability to establish and follow through on a writing plan. He says, “I make my own 30-day calendar every month and write down how many articles I can manage to do each day.” Then, at the end of each day, he goes back to his calendar and checks on his progress. What sets him apart from other authors is that he implements his plan patiently. Early on he discovered that sometimes things get in the way of the plan. Sometimes an article idea doesn’t pan out the way he intended or external circumstances get in the way of him sticking to his plan. By aiming high at first and staying flexible, he doesn’t get discouraged if a writing session turns out differently than he expected. When Pawel is in the middle of an article writing and marketing campaign, he writes in sets of three articles. He says, “I try to write three articles per day. This way I don’t get bored with it and the articles I write are of high quality. It is important not to ‘produce’ content in a mindless way but to focus on each problem and approach it from the right perspective.” By writing in sets, he also gets consistent traffic that lasts longer. He offers this piece of advice regarding sets of articles: “If you want to write a few articles around similar keywords, it is best to prepare a mind-map or a set of ideas before you start writing. This way you will be able to mix them and create unique content for each article.” This strategy has helped him dig deeper into topics and write more detail-oriented content. Aim high and stay flexible when setting goals in your writing plan. Things can get in the way of you implementing your plan, but if you stay flexible, you’ll eventually find the sweet spot and know how to react when distractions get you off course. Write sets of articles rather than single ones. Getting into “The Zone” where you can just let ideas flow directly onto paper can take some work, but once you’re there, take advantage and keep writing. Plan to write about things that interest you. Doing research and expanding your knowledge makes writing easier because it doesn’t require extra motivation. Don’t sacrifice quality for quantity. Each article should serve a purpose and introduce something unique and original. Use keyword research tools to provide direction and detail in your writing. Having a constant stream of new ideas through keyword research gives the writing process a better flow. Writing plans increase the regularity and consistency of the writing process. If you don’t have a plan already, use these tips to build a plan for your next set of high-quality, original articles today. Let us know what your writing plan does for you in the comments section below. I love dogs too. I think i can learn many thing from his articles,and know how to get on well with other dogs. Love it! All great advice and tips. Keep on writing, Pawel! So true needing a plan! Life does get in the way very easily if a writer lets it. Since there are so many places that a person can write content, either on their own website, blog, or to any of a number of article directories, the plan needs to be detailed and very specific. After taking an unforeseen and unexpected hiatus from EzineArticles, I can’t wait to jump back in.